As a follow on to their ideas relating to the development of the ATP synthase complex, Koonin and his group have a paper suggesting that sodium bioenergetics were primordial to the origin of life. Happily, like their ATP synthase paper, it's free full text so people can make their own minds up as to how good the arguments appear. I think they may be correct. 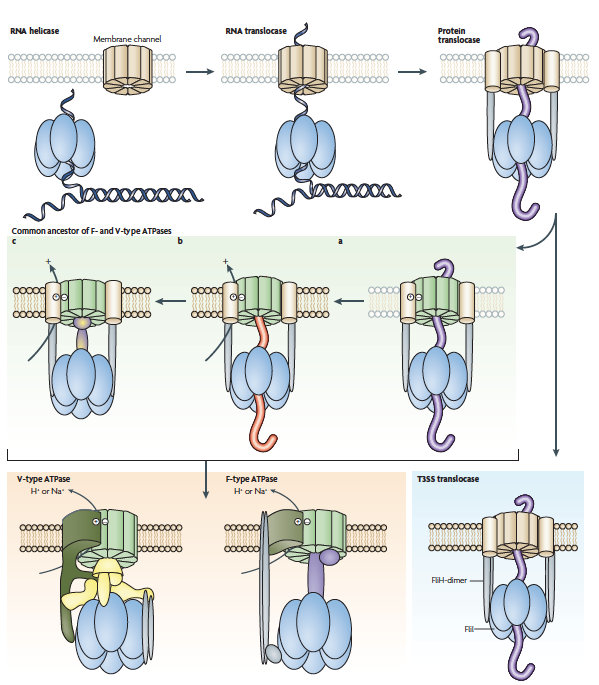 They go on to suggest that the precursor to the ATP synthase complex used Na+ ions to stabilise the structure of its intra membrane section, derived from the membrane pore, and that it was these Na+ ions which were extruded as the changes occurred when a translocase became an ATP driven Na+ extruding motor. Lane rejects Na+ only bioenergetics in a footnote on pages 146-8 of his latest book. The rejection is the weakest page in the whole text and he doesn't really explain it, excepting he seems wedded to proton translocation as being physically related to ferredoxin reduction, which I doubt is needed. It's not a "reduced FeS synthase-like" machine, as far as I can see. 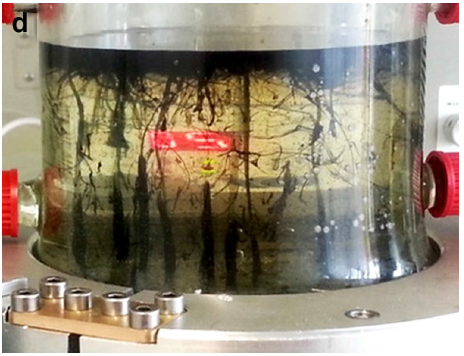 The generation of formate under simulated vent conditions needs nothing other than a completely randomly structured amorphous Fe/NiS matrix, nothing cell-like or translocating is required for this aspect in Lane's bench top reactor. It dawned on me during the pre-posting tidy-up of the last post that you could use both ideas together. Take Lane's ideas about a sustained source of reduced carbon compounds based on a pH differential, with a proton gradient being utterly essential for redox conditions but reject H+ translocation as being a mechanical essential for FeS reduction. What is needed is reduced FeS. This is available immediately, certainly within four hours, in the group's bench top reactor. Energetics would be based on formate and acetate, the later giving substrate level phosphorylation capable of yielding ATP. For this scenario you have to reject a role for any sort of primordial H+ powered ATP synthase. This suits me. What is then needed is some sort of support (I have none) for the idea that nascent metabolism occurs more effectively with a reduced sodium level within the cell. This might be testable. Quite how I don't know, but there are clever people out there that might have some ideas. 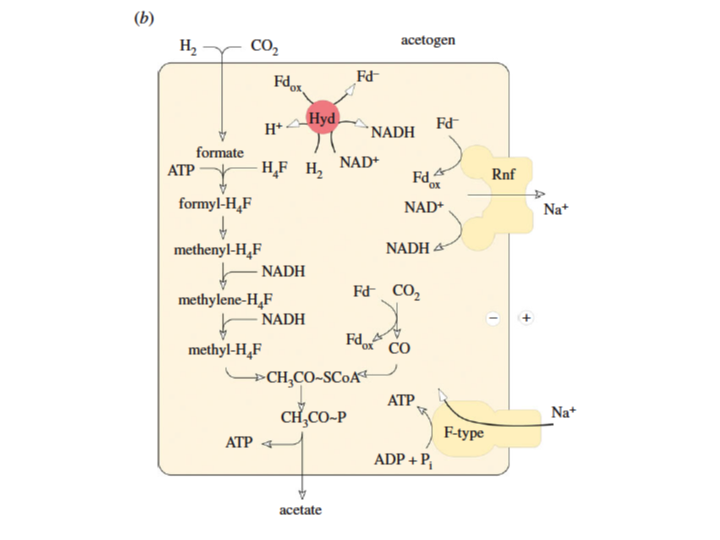 Assuming there is some net benefit to a cell from having lower Na+ levels within, then there is some benefit of the "accidental" generation of a sodium pump based on Koonin's scenario of ATP synthase formation. 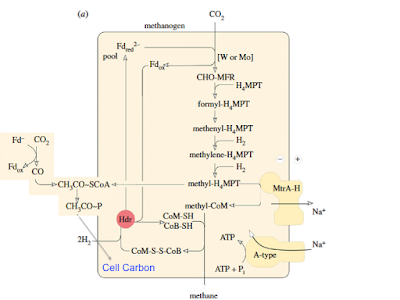 This makes ATP synthase in to the primordial Na+ pump, at the cost of ATP consumption. 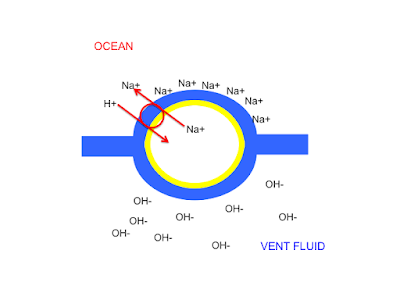 That's OK in a vent as ATP is fairly free, provided by the H+ gradient via acetyl phosphate. Though there might be better uses for the ATP if ATP-consuming pumping wasn't needed. Subsequent development of a Na+/H+ anti porter would radically drop the Na+ concentration within the protocell, and it would do it completely for free, without needing to divert ATP to pumping. The rapid drop in intracellular Na+ then reverses the outward pumping of Na+ by ATP synthase which then allows ATP generation at the cost of allowing Na+ back in to the cell. This can be continuously corrected by the anti porter. 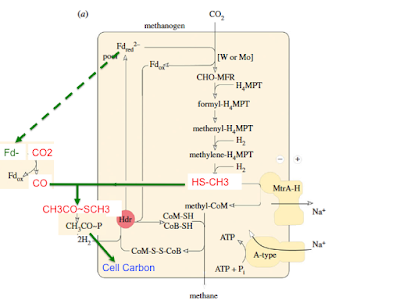 The low Na+ intracellular environment then becomes beneficial in its own right and drives subsequent evolution to tailor protein function to run best run in a high K+, high Mg2+ and low Na+ environment. To escape the vent H+ gradient the anti porter then needs to be converted to be driven by reduced ferredoxin from electron bifurcation rather than from a proton gradient based redox potential and away we go. Just thinking. Makes sense of both camps. I'll try and shut up about the origins of life now. PS Conversion from Na+ to H+ pumping has occurred on several different occasions in microbial evolution. It's quite easy to drive ATP synthase by either ion, given the similarity in size and charge between the Na+ ion and the hydrated H+ ion, H3O+. The drive for H+ energetics appears to have been the development of redox chains with cytochromes, which are totally proton dependent. Nick Lane's ideas that Na+ energetics are limited to extremophile or acetate rich environments does not hold true for Na+ pumpers in the anoxic deep mud of Woods Bay. Simply evolving without cytochromes seems to be enough to preserve Na+ bioenergetics. Cytochromes are so powerful most organisms went that route. But not all. Labels: Life (05) Why sodium ions? In the beginning there was an acidic ocean, alkaline hydrothermal fluid and a precipitated Fe/Ni sulphide catalytic interface. That, to me, is a pretty good start. The full paper is here and can be downloaded for free. This much can be demonstrated on the bench top. 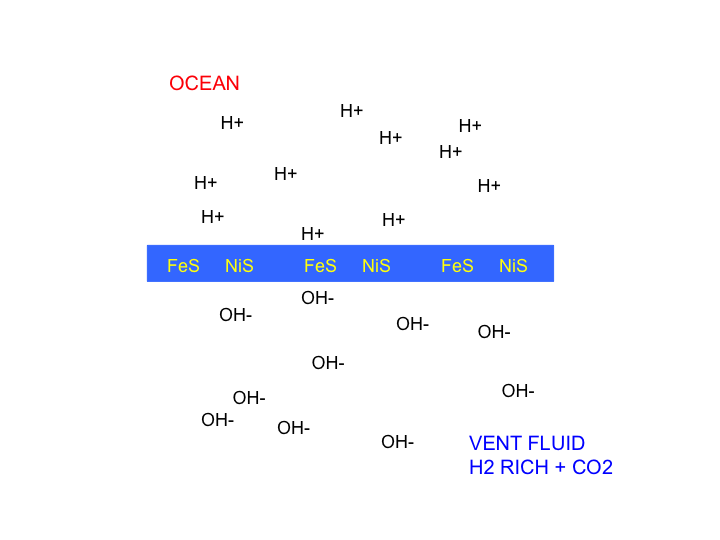 It relies on far-from-equilibrium conditions modelled on those found at alkaline hydrothermal vents. These vent systems are not volcanic in origin, they are generated by the conversion of olivine to serpentine by water and are stable over geological time scales. This is a source of carbon, produced on a continuous basis, which can react further to give many organic compounds essential to life. No further energy input is required. The next step needs us to get much more speculative and to consider the situation in a microporous FeS structure like the one fossilised at Tynagh in Ireland. 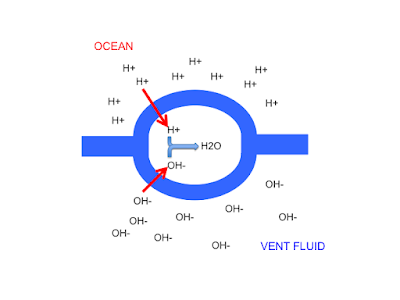 Imagine that we have a porous honeycomb of FeS which allows protons from the ocean to combine with hydroxyl ions from the vent fluid within a hollow vesicle. This neutralisation of protons allows continuous flow of more protons in to the protocell. However, once it is there, the gradient becomes a source of useful potential in its own right. 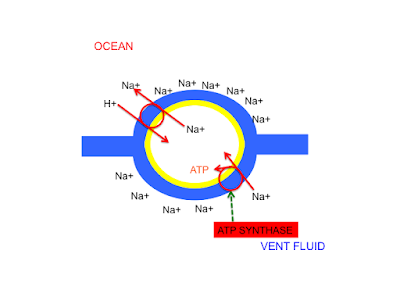 Recall that ATP synthase probably started as an ATP consuming, sodium extruding, modified protein translocase. It is very plausible that this initial usage of ATP to lower intracellular Na+ as a supplement to the anti porter. 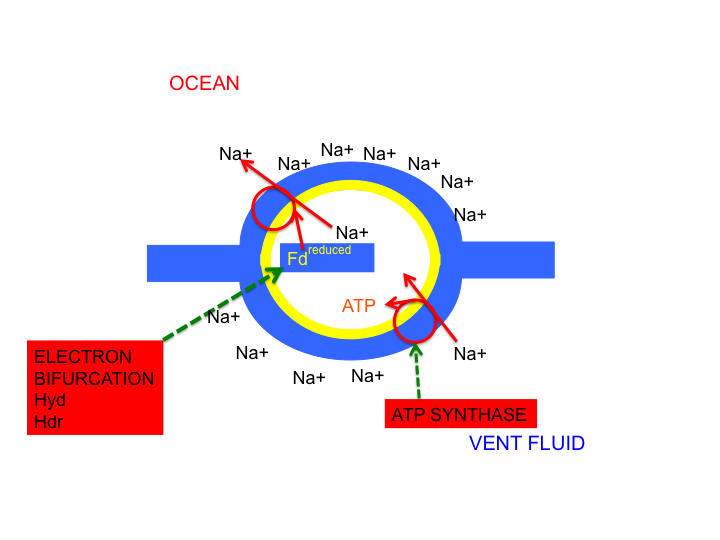 When the vent fluids are providing Na+ lowering for free, the lowered intracellular Na+ level makes it increasing difficulty for ATP synthase to further expel Na+ ions and provides an increasing pressure for it to run in reverse and convert the Na+ gradient in to ATP, especially under conditions reduced availability of ATP. This gives bulk ATP production coupled indirectly to the H+ gradient of the vent via a biologically generated Na+ gradient across a relatively non sophisticated membrane. [The more I think about this the more ATP synthase may well have been acting as a Na+ pump BEFORE the Na+/H+ anti porter developed, i.e. 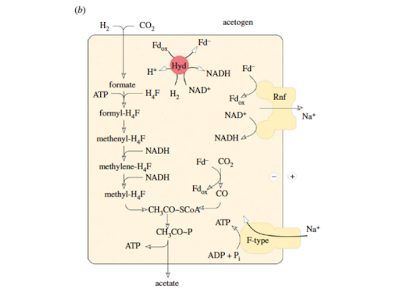 a reduced intracellular Na+ was being paid for with ATP from substrate level phosphorylation via acetyl phosphate derivatives until the anti porter developed. The anti ported suddenly out stripped ATP synthase's ability to expel Na+, did it for free so long as the vent fluid was there, and so could reverse ATP synthase to make an actual synthase rather than a consumer of ATP. Makes sense, to me anyway]. 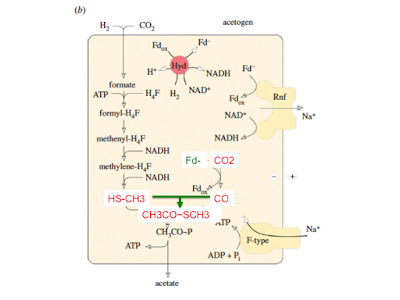 Hyd stands for soluble hydrogenase and Hdr is heterosulphide reductase. These take H2 and split the pair of electrons available. One electron goes steeply down-potential and the free energy of this reaction is coupled to getting the second electron to a potential where it can manage the generation of the reduced FeS which was originally provided by the proton gradient. Ferredoxin is a very primordial FeS containing protein. It stores low potential electrons on an FeS group and moves them around to places where they are needed. 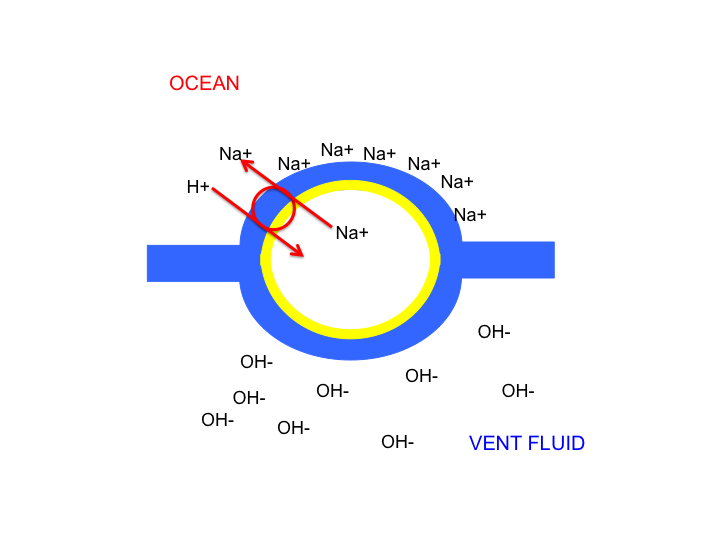 To a Na+ ion pump for one. From previous posts the archaeal and bacterial lineages have already divided before leaving the vents. The technique for electron bifurcation is different and the locking mechanism for ATP synthase is also different. The problems are the same, the solutions are clearly related but not quite identical. 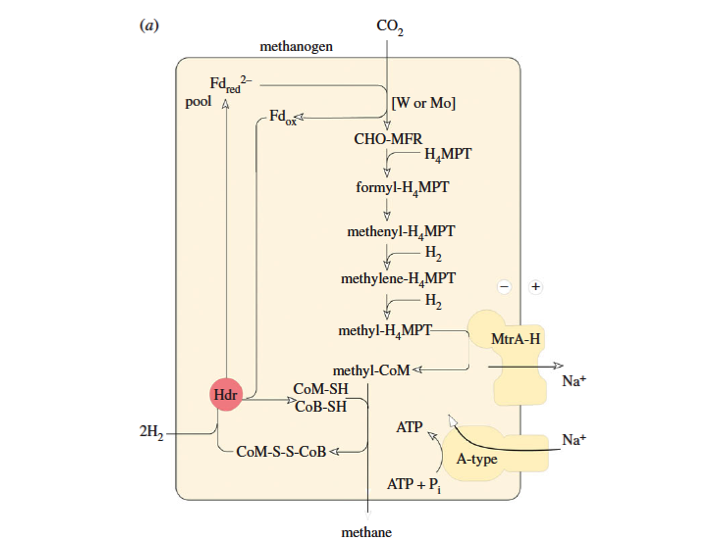 We can overlay this set of ideas on to the metabolism of modern Na+ pumping methanogens and acetogens by modifying the diagrams from Sousa et al's Early bioenergetic evolution. 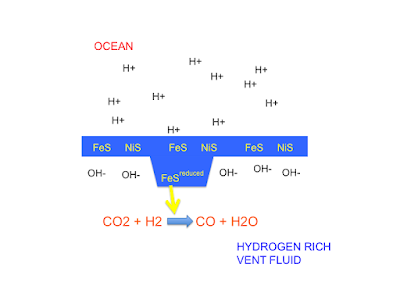 The soluble hydrogenase (Hyd) is using electron bifurcation to generate the Fd- to drive the reduction of CO2, replacing the vent proton gradient. This Fd- is also being used to drive Na+ expulsion via Rnf, a Na+/H+ antiporter modified to use Fd- to replace the proton gradient. Rnf is the ancient ancestor of complex I. Complex I still carries the anti porter component of Rnf. [I've not bothered correcting the small typo in Sousa's diagram]. CHO-MF is formaldehyde safely stored on the cofactor MFR. 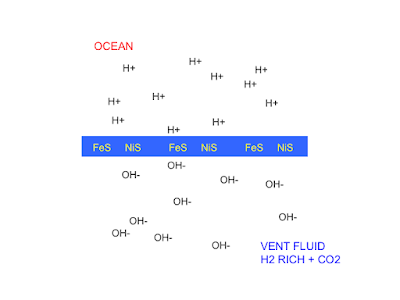 CHO-H4MPT is simply a change of the cofactor used for storing the formaldehyde (formyl-H4MPT). Removal of the oxygen atom of CHO reduces the formaldehyde to a CH moiety triple bonded to the cofactor (methenyl-H4MPT). More reduction gives CH2 double bonded to the cofactor (methylene-H4MPT). Next reduction gives a methyl group attached to the cofactor. This (CH3-H4MPT) is over written by the HS-CH3 in the diagram as they are doing essentially the same job. This methyl donor can be used for carbon fixation via acetyl phosphate or to drive Na+ expulsion via the MtrA-H complex. The later is probably based around the same Na+/H+ anti porter as Rnf but has a different module, methyl derivative powered, added to replace the proton gradient. 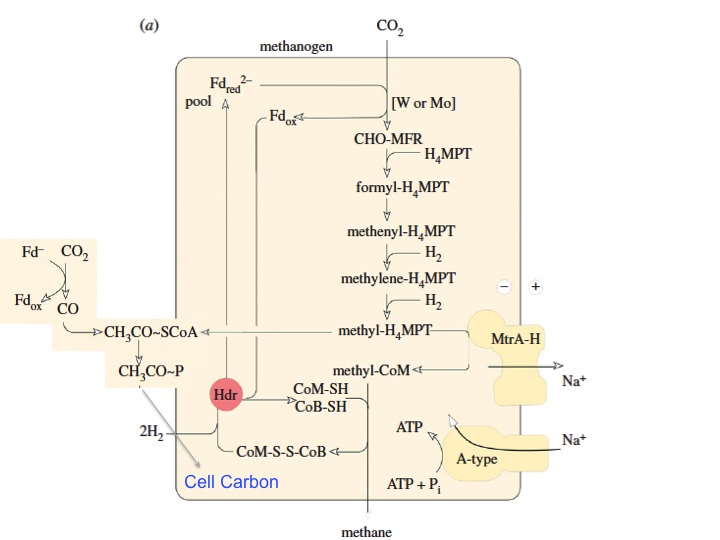 We can follow through from the very basic acetyl phosphate pathway, plus a Na+/H+ anti porter, plus a power source to replace the H+ gradient component of the anti porter, plus an ATP synthase, to give us a picture of the pathways giving rise to those acetogens and methanogens which have developed the origin of life pathways to highly sophisticated modern derivatives but with minimal changes to the general principles. 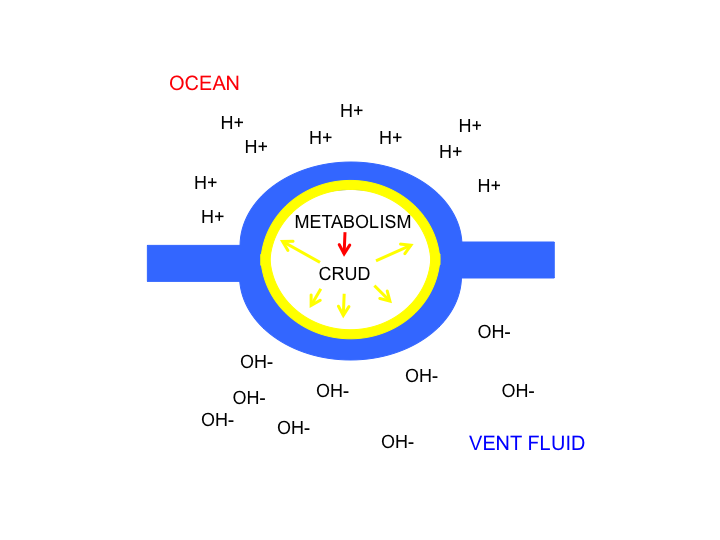 This is the logical picture which other origin of life scenarios are up against. I like simple logic. I like this hypothesis. It may be incorrect, but I hope not. I have to admit to having done something embarrassing. I grew some cress. Two lots in fact. One was on the dining room windowsill as a control, the other was sandwiched between a wireless router and an Apple base station, about 30 feet from the first tray. I know there are two wifi routers there in the picture as well as the base station but the second one was only turned on for the last two days of the six day growth period shown here. Tasted as good as cress ever does. Not something I rave about personally. Well duh, as my daughter (frequently) says. There is a limit to how much cress a given household can consume, even with Daniel liking vegetables. I'm also embarrassed that I even contemplated that the cress might fail to germinate next to the router(s). The author of the following open letter to Medscape (I think you have to register to read, so I've copy/pasted it to make access easy), a Dr Mandrola, is not a THINCS member that I'm aware of. Not a Dr Ravenskov or Dr Kendrick. He appears to be a mainstream cardiologist who is aware of how essentially all lipid lowering trials have bombed and that statins, whatever small benefit they show in drug company funded secondary prevention trials, probably don't work by LDLc lowering. He is urging caution on PCSK9s. This is good. Never mind the known cognitive decline. My guess he is worrying (but not talking) about what the cancer death rate will have risen to by five or six years down the road. He has read J-LIT. I know this is not unprecedented. It just feels like it. There really are medics in the cardiological wall who do think and who possibly care. That's nice to see. Last week, an FDA advisory committee recommended approval of two proprotein convertase subtilisin kexin 9 (PCSK9)–inhibitor drugs. A formal decision is expected later this summer. The FDA usually follows the advice of its advisory committees, but not always. This is a big moment in cardiology. It is also a huge gamble for the FDA. I believe the FDA should break with its advisory committee and say no. Not yet. It's too early to unleash these drugs on American patients and doctors. The first reason the FDA should say no (not yet) is the target. PCSK9 drugs lower LDL cholesterol. That fact is clear. But our target is not a lab value; it's heart disease. Any doctor who sees patients knows heart disease comes from many things. These factors, which affect individuals in genetically varied ways, accumulate over years, not months. LDL-C may be important, or very important, but it is just one risk factor. Even in patients with familial hypercholesterolemia, LDL-C may be one of many risk factors. The stunning LDL-C lowering from PCSK9 drugs might prevent future heart attacks, strokes, and deaths. The key word in that sentence is might. We don't know. The biology of these drugs is beautiful, but that beauty should not obscure the current state of knowledge. What we know now is that PCSK9 drugs are effective at LDL-C lowering. That is it. The OSLER and ODYSSEY trials were not powered to look at outcomes. Those data are forthcoming in the FOURIER trial, which has completed enrollment of 27,000 subjects, and results are expected in 2017. Why not wait? The second reason the FDA should hold off is the risk. The mission statement of the FDA says its charge is to "protect the public health by [ensuring] the safety, efficacy, and security of human and veterinary drugs, biological products, medical devices, our nation's food supply, cosmetics, and products that emit radiation." What I read into that is harm avoidance. In this way, I see the FDA's role as similar to a physician's. Yes, we want to benefit our patients, but the guiding principle must be to avoid harm. This is especially critical when treating people for something (an MI, stroke, or death) that has yet to happen. Having a high risk for a disease is not the same as having a disease. It is true; in both the OSLER and ODYSSEY studies, evolocumab (Repatha, Amgen) and alirocumab (Praluent, Sanofi/Regeneron) looked reasonably safe. But follow-up was only 11 months in OSLER and 78 weeks in ODYSSEY. That's too short. Heart-disease prevention is not a 2-year endeavor. In both studies, more patients on the PCSK9 inhibitor reported neurocognitive effects. That may be significant. Is it implausible to think cholesterol might be important for brain cells? Here, let's also be mindful of euphemism. "Neurocognitive function" is a fancy way to say "think." Thinking is what makes us human. So if we think of this issue from a patient-centered standpoint, how many humans would trade a dull mind for a possible benefit 2 to 10 years in the future? The third reason the FDA should say no is historical. The use of surrogate markers for cardiac drugs has proven to be a bad gamble. We can point to niacin, fibrates and cholesteryl ester transfer protein (CETP) inhibitors as evidence of that failure. Although statin drugs are potent LDL-C lowering agents and proven effective in reducing cardiac events in high-risk patients, no one argues these drugs don't have important pleiotropic effects. The case of ezetimibe is hardly supportive of the LDL-C hypothesis. In the IMPROVE-IT trial, the tiny absolute benefit of ezetimibe (composite end point) was achieved against simvastatin—a straw-man comparator if there ever was one. The fourth reason the drugs are not ready is the potentially harmful effects of distraction and benefits missed. Many have argued, including patients with familial hypercholesterolemia, that PCSK9 drugs should be approved now because of the benefits missed while waiting for the FOURIER data. Of course, this assumes positive results are forthcoming. Another way to look at benefits missed is to imagine the devastating impact of all that will not occur if these expensive drugs are approved. If we spend billions of dollars on these drugs—and make no mistake, if the FDA approves them, we will spend billions, then that takes money (and attention) away from many other facets of heart disease prevention. Look at the case of ezetimibe, the last drug approved without outcomes data. Billions were spent on a drug with minimal to no effect on outcomes. What were the benefits missed of those billions? Healthcare budgets are limited. If we spend money on unproven drugs, we aren't spending it on cardiac rehab programs, parks, bike lanes, school nutrition programs, and many other useful heart-healthy public-health projects. 2017 is just around the corner. I say the FDA should resist the urge. Protect the public. Do no harm. The two new drugs, both of which are proprotein convertase subtilisin kexin 9 (PCSK9) inhibitors, effectively lower LDL-cholesterol levels. "If you're a cardiologist, you must not have a pulse if you're not excited" about the potential availability of the two new agents, Dr Amit Khera (University of Texas Southwestern Medical Center, Dallas) told heartwire from Medscape. "For those of us who take care of patients with familial hypercholesterolemia [FH], this is just an amazing option," he said. "I know this seems like a small group of patients—one in 500—but it's really not all that small. There's also the advanced coronary artery disease patient who still has high lipids. It almost seems arcane in this modern era that we're just watching patients who have recurrent events and our hands are tied. I think this offers an incredible option for those people." The hands tied option which caught my eye. I’m not sure if it was Pat Wall or Ronald Melzack, writing about chronic pain, who came up with the gem that “The best surgeon to consult for a chronic pain problem was one who had no arms”. Nothing changes. We’ll have to wait to see the body counts. Gluten: Not your average plant toxin? He's filled out the core findings (with lovely histo pictures) and posted about it on his wife's Rosemary Cottage Clinic blog. The paper is rather neat and I have a great deal of time for Prof Murch. Labels: Gluten: Not your average plant toxin? How do you build an ATP synthase complex? On the surface it looks to be utterly incomprehensible that a lipid embedded, ion gradient driven rotor should turn a stalk to a set of molecular forceps each of which forces a phosphate on to an ADP to give ATP as the rotor turns. It's particularly striking that Nick Lane considers this to be one of the core molecular machines present in LUCA before the separation in to the populations which gave rise to the archaeal and bacterial lineages. Running on a proton gradient. It would need to have been a very early development. If we buy in to the alkaline hydrothermal vent scenario (Koonin doesn't) for the origin of life we have microscopic "pockets" of metabolism in iron (+/- nickel) sulphide walled chambers at the boundary of alkaline vent fluid with acidic ocean fluid. In the progress towards something akin to life there has to be the development of both protein and RNA. In a vent system, where conditions at the microscopic scale vary from time to time, the ability for a given replicator (RNA based) to spread itself over the maximum number of protocells would provide a survival benefit. The development of any sort of cell membrane is clearly a hindrance to this process, potentially terminal. The formation of simple pores of protein derivation are not inconceivable and would allow the continued spread of successful RNA to a maximum number of protocells. Pores do not have to be complex. RNA spread can be concentration based. RNA will form double helices. Not with the solidity of those derived from DNA, but double helices never the less. There is a large family of proteins which unwind helices to allow replication, be that of DNA or RNA. Many of them use ATP to facilitate the process. They are very basic machines by evolutionary standards and there is no reason why they were not as available early in evolution as simple membrane pores. Bear in mind that one of the core products of protometabolism is an acetyl thioester capable, energetically speaking, of producing ATP (was that as long ago as February?). Across the top we have the possibility of an ATP driven RNA helicase sticking itself to a membrane pore and using ATP to power RNA export through a proto membrane bound protocell. The helicase, if it sticks itself to the membrane pore, will extrude an RNA strand out of the protocell. As any helicase passes down an RNA strand, it rotates. If the helicase is fixed to the pore, the RNA will rotate as it passes through the pore. The right hand diagram shows the next development with an RNA strand replaced by a protein strand, not an impossible transformation and still potentially of benefit to a proto replicator. Working along the middle row from right to left we have a protein translocator using ATP to export a protein using the same rotary machinery inherited from the RNA helicase/translocase. The + and - within the circles represent electrostatic charges which normally hold the pore and helicase stationary relative to each other. The middle diagram has a red protein which is physically stuck in the pore. The rotary component, powered by ATP, pushes/twists against the membrane bound section while the electrostatic charges resist rotation. Something has to give and in the process an ion or more is squeezed outwards as the pore derived section moves against the stator section. The machine extrudes ions by consuming ATP. 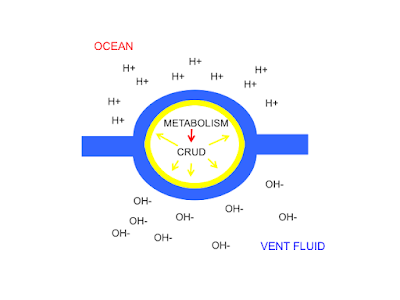 Ion gradients have many uses to protocells so the development may well have been advantageous at the time. The machine also works perfectly well in reverse so, given an appropriate ion gradient, it will generate ATP as ions enter the protocell. The ion gradient itself is a whole different ball game. 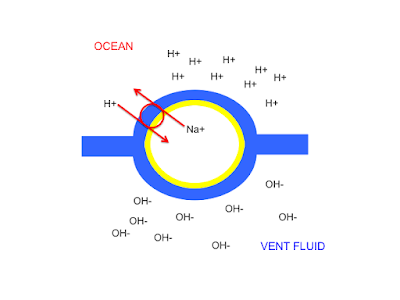 Just for now recall that in those archaea and bacteria which lack cytochromes, the gradient is of Na+ ions, not H+ ions. Another post there. 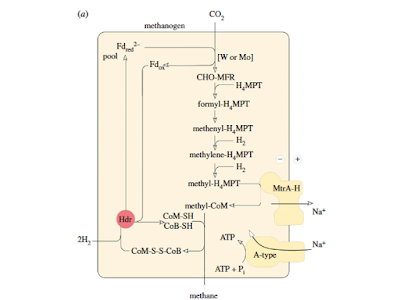 This is a plausible derivation for the bacterial/mitochondrial F type ATP synthase. The archaeal V type ATP synthase has very similar ion pump and ATP synthase sections to the F type, but the central stalk is quite different. In fact it doesn't look much like a stalk at all, see the bottom left diagram in the above figure 2. It looks more like a protein used to stabilise the pore and helicase sections against each other. It does the same job as the central stalk of the F type synthase but its origins are clearly different. The ATP synthase complex was developed twice. It looks very much as if the pore/helicase combination was ubiquitous in LUCA but the system of locking them together is different in the archaeal vs bacterial lineages. That seems very profound to me when thinking about LUCA. The scenario does not have the ATP synthase as primordial. The system evolved as an ATP consuming machine, not an ATP generating machine. It has no hallmarks of the core power producing system in LUCA. Where did the ATP come from to power the engine which was eventually to become the dynamo? I commented in my post on the reduction of CO2 to CO that the acetyl thioester produced was quite capable of substrate level phosphorylation. It is able to produce molecules in the energetic range of ATP and undoubtedly did so, because we are here today we are and running on ATP. ATP is undoubtedly what worked best for the RNA helicase as it appears to have carried this preference forwards to the protein translocase and hence the ion pump which reversed role to become a dynamo. If the helicase had been powered by acetyl phosphate rather than ATP I can see no reason why metabolism might not be based around such a molecule. We use ATP because that's what worked best in the motor which, once it reversed to become a dynamo, unleashed a ubiquitous supply of energetic substrate based on an ion gradient. Just to recapitulate: A proton gradient is essential to power protometabolism because without it you cannot reduce CO2 to CO to develop acetyl thioester and its assorted phosphorylated derivatives. This substrate level phosphorylation is utterly proton gradient driven but does not require proton translocation per se, although proton translocation may have been used to produce a localised environment which reduced ferredoxin. 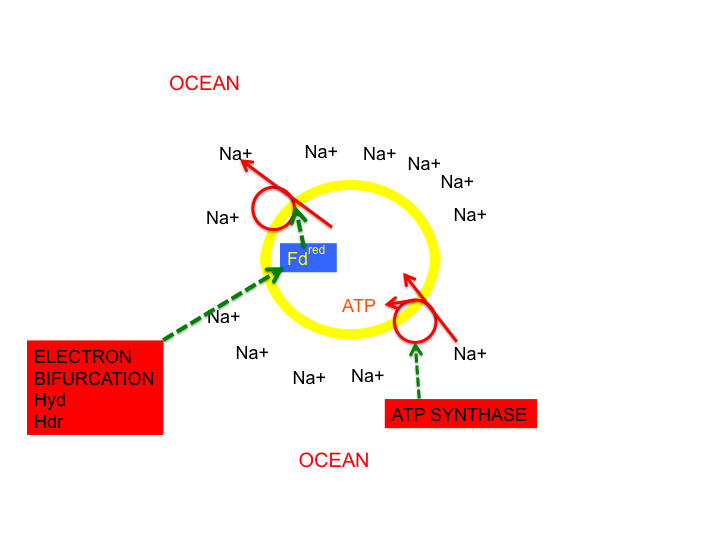 A source of direct ATP synthesis was required to power an immediately useful translocase which allows development of an ion pumping motor which could subsequently be reversed to provide an ATP generating dynamo as the membrane energetics changed. 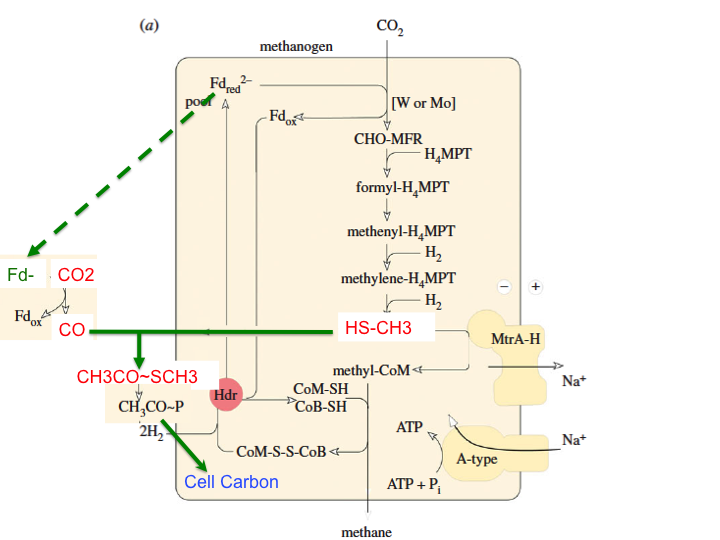 The change in membrane energetics was probably related to a biologically generated Na+ gradient in addition to the geochemical H+ gradient. If the sodium ion gradient was supported by anti porting on a geothermal H+ gradient, it was both free and nearly unlimited in availability. So we have to think about antiporters.